As the story goes, a Greek explorer named Pytheas claimed in the Fourth Century BC to have discovered the most northerly land in the world and he named it Thule. The place was described as near a frozen ocean and home to people accustomed to seasons of eternal light and darkness. Author Joanna Kavenna, in her book The Ice Museum; In Search of the Lost Land of Thule, wrote that Thule was seen once, described in opaque prose, and never identified with any certainty again. "It became a mystery land, standing by a cold sea. A land at the edge of the maps." 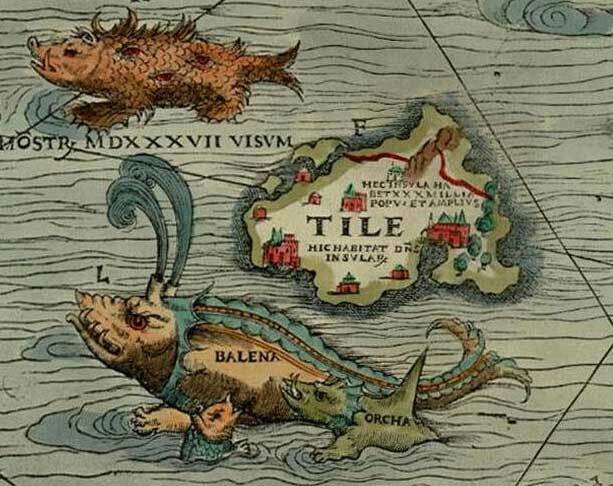 It seems that the legend of Thule has captivated the imaginations of Europeans as much as Atlantis has caught that of the Western world. Explorers have actually searched for the place, and there was once an occult organization in Germany known as the Thule Society. It seems that Kavenna set off on a private mission of her own to visit all of the northern lands in an attempt to find and identify the place Pytheas described. Her travels gave Kavenna much to write about, but the place was not truly found. My first reaction upon reading the article was that I have known Thule’s location most of my life. When I was in High School we had a science teacher named Dave who arranged a deferment from his stint at a U.S. Air Force base in Thule, Greenland, to teach science in our school. There was such a critical shortage of science teachers that such things could be done then. Dave was probably one of the best teachers I had in high school and he had a profound impact on my life. When I took on a term paper for an English class, I chose the topic of evolution and attempted to balance Darwin’s concepts of evolution against the Christian story of creation. When he heard of my topic, this man called me to his office, gave me lots of encouragement, and directed me in a field of study that made the research and writing of that paper more fun than I could have imagined. During our conversations, this teacher frequently joked about Thule as a place nobody ever wanted to go. It was on the northern edge of the world in a place where nobody ever wanted to live. Yet the United States maintains an air base at Thule where an estimated 55,000 people live and work, my research shows. It is, indeed, located not far from the northern end of Greenland at a place where the sun really does not set for months, and once it does, the night lasts about as long. Thule Air Base is the United States Air Force's northernmost base, located 750 miles north of the Arctic Circle and 947 miles from the North Pole on the northwest side of Greenland. Small wonder my old friend Dave pulled strings to get back to the United States. The air base was established there in the early 1950s, in the midst of the Cold War and when the Korean War was just heating up. It seems the selection of the name was taken from the legend. The base probably is not where the Greek explorer set his sights so long ago. But then, it might have been. We will never know.